Insight investigates the ethics of the fashion industry. With more than 80 billion items of clothing purchased every year, where are they being made and by who? The Insight team examines how our desire for cheap clothes is raising big questions for the industry. I am involved in an initiative called Business for the Unseen (BFTU). We bring together companies in work groups to use our collective voice to influence and improve the lives of unseen people such as workers in modern slavery, bonded labour and forced labour, in places like China, Korea, Japan, Jordan, Mauritius. A few other industry initiatives are doing this, but there aren't enough for these particular hot spots, yet we see that companies want to be involved. We've had good feedback from big firms that want to have more support to work in these ways. I have a passion for these issues, especially when it comes to east Asia, Japan, Korea. I speak some Japanese and I speak Chinese. I've spent half my career working in east Asia so I bring unique experience for companies trying to work on the issue from Europe. What was your biggest challenge in setting up BFTU? Work-life balance and finding the time in my own life to take the steps that need to be taken: registering the company, building the marketing materials and the website, submitting proposals, attending meetings. This means I say 'no' to other things. Let's talk about your recent work as a consultant for the World Bank. The World Bank’s remit includes sustainable development. They realised that they needed to do more on gender and women's empowerment. When a World Bank team looked at Bangladesh, they realised that the garment sector represents 80% of exports. Sixty to 80% of garment workers are women, so they decided to work with the garment sector to support women in Bangladesh. Someone in the World Bank who knows me from China introduced me. As so many projects like the HERProject and the PACE Project already work in women’s empowerment, I suggested to the World Bank that we needed to convene many players, to study what is being delivered, and to learn what works to scale and strengthen that, rather than duplicating. We spent a lot of last year working out a model by which the World Bank can bring funding and their skills to support women's empowerment efforts in the garment sector in Bangladesh. My role was mapping efforts in the industry for the World Bank team, showing them what's going on, introducing and bringing everyone together, designing and facilitating workshops. I was advising on what was being undertaken on gender issues in factories by brands CSR (Corporate Social Responsibility) and Ethical Trade programmes, NGOs, and trade unions (such as The Bangladesh Accord on Fire and Building Safety). The World Bank team were really excited to get introduced to new players and to learn how CSR is not just philanthropy, but it's about strategically working with factories, the government and the industry to drive sustainable change. You've been in the field for a while, has there been a before and after the Rana Plaza garment factories collapse? Yes, very much so. Before Rana Plaza, I left Burberry because I wanted to work on the living wage question. I was working on my own social enterprise with Cambodia, with women making eco fashion. We were ready to launch when Rana Plaza happened. I realised that I had to help with the response to Rana Plaza. I watched the collapse on TV every day, as the death toll kept going higher as people were pulled out of the building. I thought: "This is my industry, we haven't done enough, I want to be part of the solution so it never happens again." At Burberry, I did not have Bangladesh sourcing, but being in Hong Kong, I was working with a lot of big brands who were always back and forth to Bangladesh, so I was involved in conversations about Bangladesh labour standards. Then I was approached by the largest childrenswear retailer in North America. They were one of the 30 brands buying from the five factories in Rana Plaza. I became Director of Responsible Sourcing Innovation and Engagement. I revamped how they worked on ethical trade and responsible sourcing. I was involved in rolling out a helpline to about 500,000 workers. I was feeding in a lot of policy and writing a lot of potential policy. It's the second time you've mentioned that people picked you because they knew your reputation. How did you establish that? I've always been a networker. When I meet someone, I connect with them on LinkedIn afterwards. If I'm going to the city I meet someone for coffee. When I was at Burberry, I participated in industry initiatives. Another reason people know me is because I put my hand up at events to say things people might be thinking: "I don't know if this is going in the right direction, is this what we really want to do?" or "Have we thought about doing it this way?". Some people go along to events and feel like someone else is going to lead and to decide but at events in our industry, it's our decision and our direction. We need to say what goes. Even though Burberry was a tiny little buyer from Asia compared to Nike, Walmart, Gap or Marks & Spencer, I would speak up if I felt something wasn't right, or if I felt we as an industry could do more for workers and for sustainable business. I didn’t let my title hold me back. As a takeaway, my advice is: don't be shy. If you've got questions, ask them, because other people probably have the same questions. If you feel that something you're involved in is not right, speak up. We can't all sit around waiting for someone else to speak up. There are meetings I go to where the facilitator is asking: "Does anyone have an answer to this question?". Everyone sits there and looks blankly, but I'm never the person to look blankly, I'm always the person to go, "Well, I don't have all the answers but here's my first answer to your question." If we all go and the facilitator asks for opinions but nobody replies, we're wasting our company's money. That's not what your employer wants you to be there for. They're hiring you because you have certain skills and knowledge, and I think it's your duty to have a go at applying your skills and knowledge towards the outcomes you think are right. My goal was never, "I want a reputation," my goal was, "I want to see the change that I'm being paid to be here for." You've worked in Asia and you were focusing on Bangladesh recently. Why did you move to London? I have reached a point in my life where I'm putting me over just work. The air pollution in Beijing and then Hong Kong got worse every year that I was there, which I found depressing and physically tiring. I needed to move to the West, with cleaner air. London and the US are the centres of my industry. I’m from New Zealand but my grandfather was from London so I have ancestry work visa rights. Why did you choose to go into CSR? At university I wanted to earn enough money to make a living so I chose Business over Fine Arts, but I also wanted to make a difference. I heard about CSR first in 1997, when it was starting. A few years later, I ended up in London, working part-time in three firms which had something to do with CSR. It's another lesson there: just take what's sitting there. 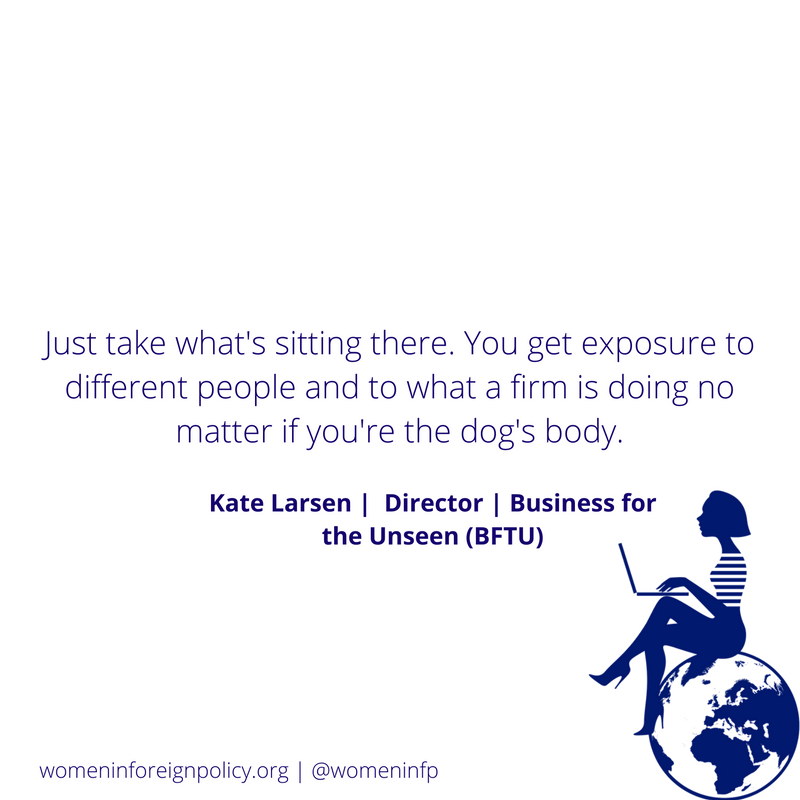 You get exposure to different people and to what a firm is doing no matter if you're the dog's body. I was working for different companies that were all doing CSR in different ways, and I got really interested in it and gained offers from all three. Eventually, I stayed at the one which had the most CSR, because I wanted to do business in a way that could have environmental and social justice impact. What's the most important thing you've learned in your career? My first job was in China with a non-profit AIESEC, and I hustled like crazy to get that job. I was home in New Zealand when I heard that the American-funded AIESEC China Manager was leaving her job. I asked whether a non-American could apply. The first person said no, but my friend said, why not. I knew this was what I wanted to do. This role was funded by AIESEC USA out of New York, but I had never been there. I ended up going to an AIESEC conference in Finland and Sweden, and the guy who was hiring was there. I'd already applied but I hunted him down. "Hi, I'm the person applying for the job, and here's what I want to do” I said. People remember if you're really passionate about a job. If you really want something, don't hide away, just reach out and go for it. We were setting up a China mainland branch of the non-profit AIESEC, which is the world's largest university-run exchange program. AIESEC was not available for Chinese students at that time. I was the third extension manager. So many people said, "It can't be done." AIESEC was a student organisation, and that time, 10 years after the 1989 Tiananmen Square shooting of student activists, there was nervousness about a student-run organisation, even though we were professional and non-political. My time as the AIESEC extension manager was one of the best yet hardest things I've ever done, but I just kept saying to my Chinese students team, "One day, AIESEC in China can be like AIESEC in India, or the US: an amazing opportunity". AIESEC went on to have hundreds of student members. There have in recent years been around 10,000 students in China involved each year in 40 or 50 universities, doing exchanges abroad, changing lives. I went back for a conference three years ago. I was taken up to the stage with hundreds of Chinese students cheering, just like AIESEC in any other country. I stood on the stage and I said to the students, "This is a lesson…. : don't let anybody tell you it can't be done." Keep believing and keep the dream alive. Don't let people's excuses get in the way. What would your advice be to a girl or a young woman who'd like a similar career? If you can, a master's degree really helps. I did mine quite late, but it really helped my thinking and it gave me a lot of confidence. The second thing is to study what you love. I studied Business, which I hated, and I wouldn't do that again. If I was doing it again I would study History, Politics or English, things I really enjoy, because that's what I do all the time (apply my knowledge of other countries, write, and work on policy). I got a little bit of knowledge out of studying business, it was a little bit useful. Experience working in businesses can be more useful. Why did you pick Business? Because I was worried about earning money, and I felt like you have to study business to have a job. I didn't understand that you can get a great job by having studied English. In New Zealand at the time, it was harder to get a career with just a degree in the Arts, but I think that's changing now. What is your advice to someone who wants to work in CSR? My big recommendation is to get on the mailing lists of some CSR newsletters. Read them and go to any free event. That’s how I started. When I got really confident after reading so many articles, I did my CV up referencing that I had been personally studying these things. I emailed 30 or 50 people who I'd realized worked in senior roles in CSR at the time. Eventually I had a few coffee meetings. At one of those coffees, the guy invited me to apply for a job on his team. My advice is always, read, study, learn about what you're interested in. For me, I spoke Chinese, I'd lived in China, I'd worked in China, so I was trying to study CSR in China. There was almost nothing written about that at the time, but whatever there was, I would read it. That lead to me becoming relatively knowledgeable about that issue. After a while, I was quite confident about what I was talking about, and that translated into someone thinking: "This person knows what she is talking about, maybe I can hire her." The skill as well as the knowledge together is the way to get in. There’s really something to be said for doing the basics. Doing the boring old sales calling, and writing emails. I spent years doing boring, simple, not very strategic work, which I later portrayed into really understanding how something needed to be done. You just learn about your industry, you learn about companies, organisations and issues. Be interested, keep learning, reach out, ask. You’ve worked for yourself and in corporate environments. How does it compare? I was in a global Director role in my last corporate role. I have found that I’m able to work on the same issues, such as labour law policy (often closely related to trade policy) with different impact outside the corporate world. I've gained more energy for the work either in a corporate role, or working with business because I’ve stepped out for a while and seen things differently. My thinking has changed and I have a different confidence from exposure. Don't be afraid to step out and see life differently. There are multiple ways that people get to have a satisfying, successful, impactful career. Work to making a difference is the most satisfying thing of all. I've been lucky that for most of my career I haven't had to worry about that level of satisfaction. In CSR (Corporate Social Responsibility) and Ethical Trade, I've had days where I feel like if we hadn't done what we did, it wouldn't have helped people's lives in the way it did. That's one thing that I'm really grateful for, that I don't have those sleepless nights where you wonder, "Why am I doing this, this is so empty". It's possible to find work where you really feel like you're making a difference and yet still have an exciting career.